Lake Truck Lines, Inc. is an oilfield transportation company focusing on the transport of dry bulk and palleted materials, chemicals, and equipment used in oil and gas exploration. Lake transports barite, gel, fly ash, and cement throughout South and West Texas for the industry’s most successful oilfield services companies. 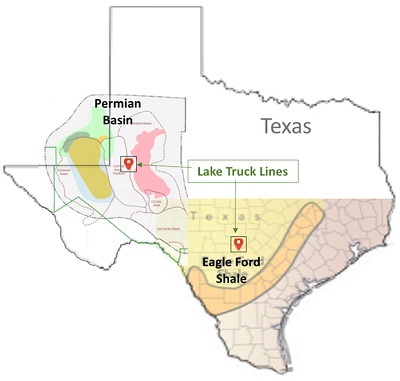 Lake’s business is split between the Permian Basin in West Texas and the Eagle Ford Shale in South Texas.